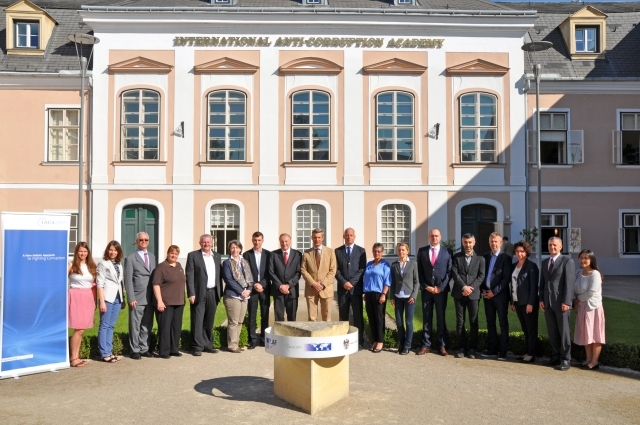 Drago Kos, Chair of the OECD Working Group on Bribery and a member of IACA’s frequent visiting faculty, led the seventh in the “Best Of” seminar series at the Academy on 4 and 5 July. The two-day programme covered a range of issues, including the roles of anti-corruption agencies, the private sector, civil society, and individuals in fighting corruption. Participants also discussed the struggle against corruption in conflict and post-conflict states, and took part in a practical exercise. IACA’s “Best Of” seminars are delivered by preeminent anti-corruption experts for professionals wanting to improve the design, management, and sustainability of their anti-corruption efforts. Previous editions have featured Professors Johann Graf Lambsdorff (University of Passau), Michael Johnston (IACA and Colgate University), Robert Klitgaard (Claremont Graduate University), Bo Rothstein (Oxford University), Susan Rose-Ackerman (Yale University), and Luis Moreno Ocampo (former Chief Prosecutor of the International Criminal Court). More information about these seminars is available here. To read a recent IACA interview with Drago Kos, please click here.